"I have personally enjoyed listening to Peter's music, and a particular favourite is his instrumental masterpiece "Rest". 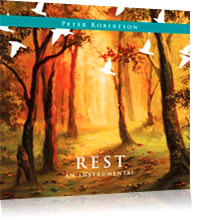 You can literally discern the anointing of rest in this beautiful work. I have no doubt that you will experience the gentle refreshing of the Holy Spirit as you allow Peter's music to wash over you." This cd is a highly recommended instrumental by Peter Robertson - an anointed musician from Australia who does all of the guitar work for The Secret Place albums. Create a peaceful, restful atmosphere in your home, work or car. Experience the refreshing sound of instrumental music cds of acoustic guitar. Let the soft easy listening instrumental cds develop a relaxing atmosphere. "You can literally discern the anointing of rest in this beautiful album - Joseph Prince"